Not even the two people usually familiar with the matter were able to convince Bloomberg that there has been genuine demand in the London market for Megafon shares at Alisher Usmanov’s asking price. Instead, as the company and its underwriters tried to sign buyers before the subscription book closed this afternoon, brokerage sources claimed the initial public offering (IPO) was anchored by an order for $170 million. That’s 10% of the shares on offer – if the company is following its undertaking to sell 15% at a base valuation of $11 billion. Nyberg’s anchor is such a minuscule fraction – 0.12 of one percent – it may not qualify, even metaphorically, as spinach. According to his company’s release, here’s what Nyberg is thinking: “I have a strong belief in the future prospects of MegaFon. As a member of the MegaFon board, making a sizeable investment in the company is a way for me to show my commitment.” The company spokesman was asked to provide copies of press releases issued over the past five years in which TeliaSonera announced private shareholding transactions by its chief executive to demonstrate comparable commitment to the preservation of TeliaSonera’s asset value. Nothing has materialized yet. How much confidence the rest of the market has that a listing price above that level is sustainable cannot be measured from the IPO formalities. More than one market source in a position to speak authoritatively claims that up to $500 million of the share purchases, or almost a third of the IPO order book, are related-party transactions. 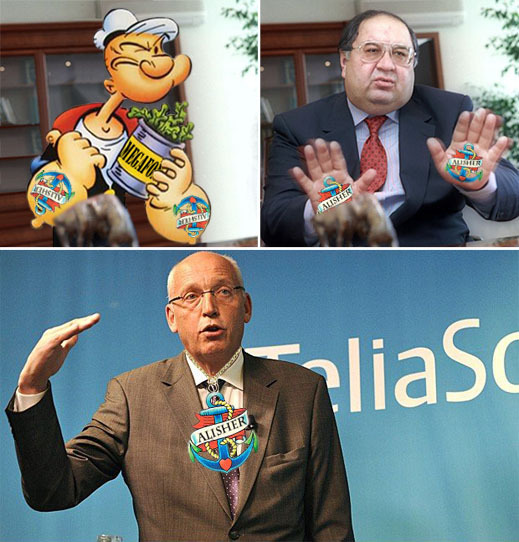 Whether this proves to be true or not, the perception right now is that Usmanov’s second attempt to fix a market price for his Megafon shares is as reassuring as Popeye’s famous dictum to Olive Oyl: “I Yam What I Yam An’ Tha’s All What I Yam”.